Woolworths closed the doors on its failed hardware chain on the weekend, but not before one of its rivals saw a golden opportunity to execute a clever bit of guerrilla marketing. 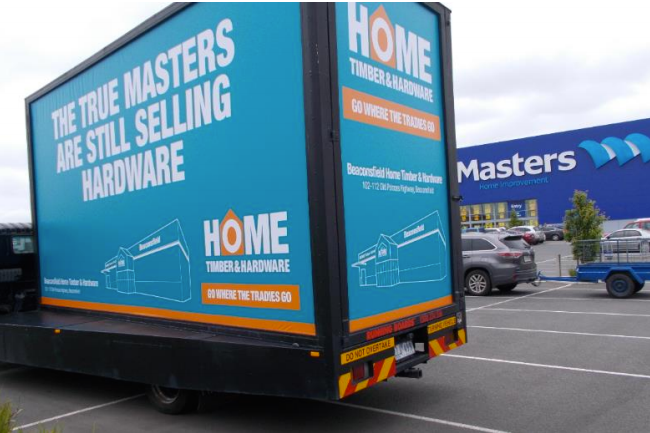 A photo taken by a customer at one of the Masters Home Improvement stores in Melbourne over the weekend shows a truck sitting in the carpark emblazoned with Home Timber and Hardware branding and the message “The true masters are still selling hardware”. Ironically, Woolies used to own Home Timber and Hardware before selling it to Metcash (which owns Mitre 10) for $165 million when it announced its plan to exit the hardware retail industry earlier this year. The writing always seemed to be on the wall for Masters too. In 2009, investment banking firm Merrill Lynch ran the ruler over the prospective business and quickly warned shareholders the idea was one big dog – some two years before the first store even opened. “We believe that Woolworths entering the hardware market will dilute returns on investment for its shareholders and will not provide the company with the growth platform that clearly its management team so strongly craves,” Merrill Lynch said at the time.